Battle Type Fusion Requirements War Greymon + Fuse Into the Ultimate Digimon! Metal Garurumon + Fuse Into the Ultimate Digimon! ◎Cannot fuse from Virus attribute Digimon. ◎Cannot lose its special abilities. 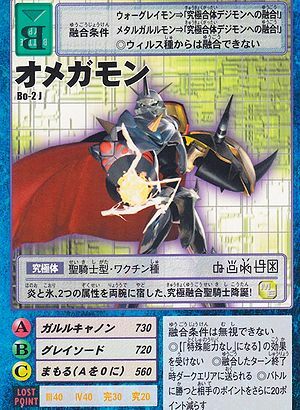 ◎At the end of the turn during which fusion took place, send this card to the Dark Area. ◎When you win the battle, the opponent loses an additional 20 points. This page was last modified on 3 December 2016, at 21:18.